Guy Powers is an agent with Canadian Intelligence. That is an assumption. 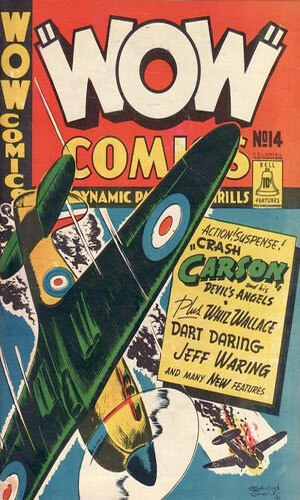 We know he is Canadian because of who is publishing the stories and because it is mentioned in the first adventure that planes were being shipped from his homeland over to England for the war effort. The Intelligence part of the statement, though, is a guess since no department employer is ever mentioned but he is dubbed a "secret agent" and he is often summoned by people needing his kind of help. The whole "secret agent" when everyone knows who you are ("Powers, I need ..." or "Mister Guy! ", or a late night call by the police for help) is questionable. Still, since he is the one called and he is the one coming up with the answers, "agent" definitely fits. The "secret" part, not so much. Powers definitely dresses the part with a trench coat and a hat. He sports a pencil-thin mustache and when his head is not covered, his hair is shown to be dark and wavy. He is not adverse to mixing it up with bad guys with either a fist or a gun but he also uses his eyes to observe and his brain to reason which is refreshing. The first few cases we find Powers working are all in the pursuit of enemy spies and saboteurs, German mostly but he keeps an eye out to the Far East as well. As time goes along and WWII draws to an end, he is found in an office bearing the title "Guy Powers Investigator" taking normal clients in his obvious role as a private eye, though one of those cases will take him over to Africa which he does without batting an eye. 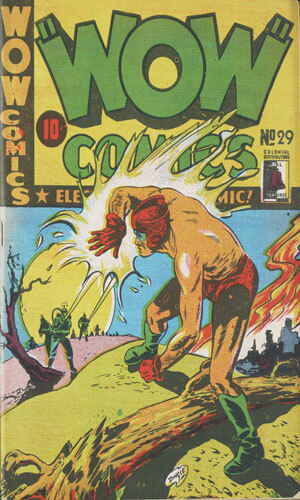 Guy Powers first appeared in the Canadian Comic Book Series called "Wow" Comics that was published and printed by Bell Features. I was told of this series by a frequent contributor, EdRoy. 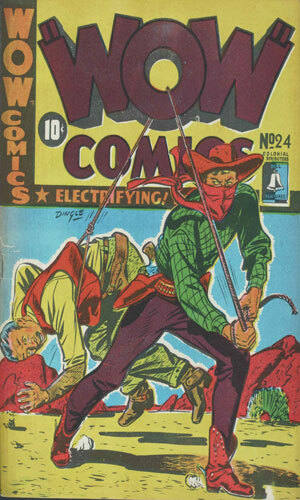 I found the issues on the terrific goldenagecomicheroes.wordpress.com. 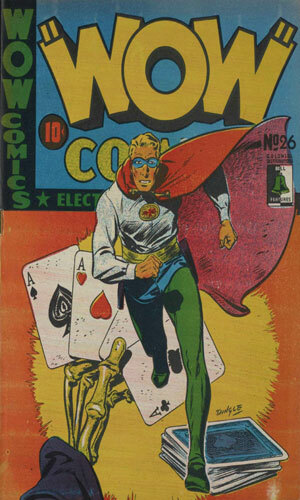 Guy Powers arrived in the pages of Wow Comics with issue #14 and apparently to honor his start he was given the opening story slot. 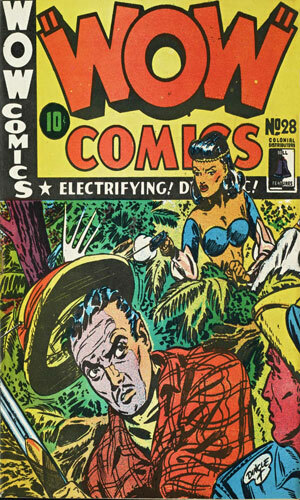 Characters who had already graced the pages of the magazine for some time followed him, people like Jeff Waring, King of the Amazon, and Dart Daring, the son of Captain Kidd, pilot and adventurer 'Crash' Carson, and freelance Canadian adventurer Whiz Wallace. 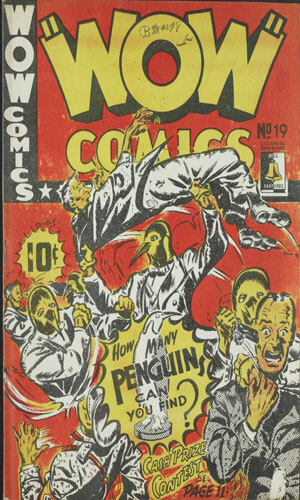 The next issue he was shunted back one slot to make room for another new arrival, this one a costumed hero with an incredibly odd looking get-up to give him a somwhat resemblance to his namesake of The Penguin. 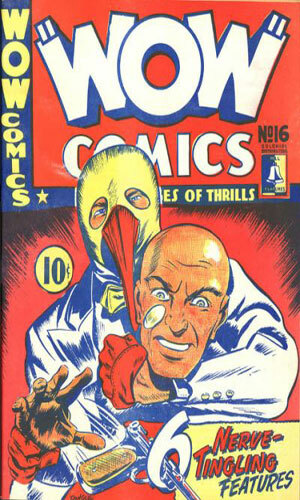 Even Batman's recurring enemy with that name did not look quite so bizarre. As the issues continued, Guy Powers' position would move further back in the magazine though he would eventually get a couple more pages in his story than he started with. In fact, the 10th adventure was 8 pages in length, stretched over two consequtive issues. 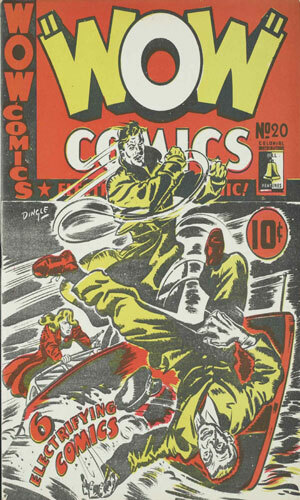 The next adventure was longer still with 10 pages again spanning two issues (5 pages each). 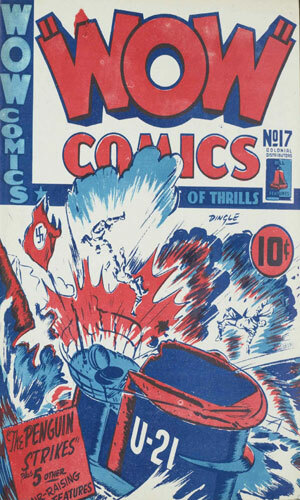 The following adventure was 12 pages long when it took two issues to tell (6 pages each). However, unless my facts are wrong, this double-issue affair was interrupted in the middle by a different 6-page adventure. If I am wrong, let me know. He remained with the title until it ended with #30, missing only #18. 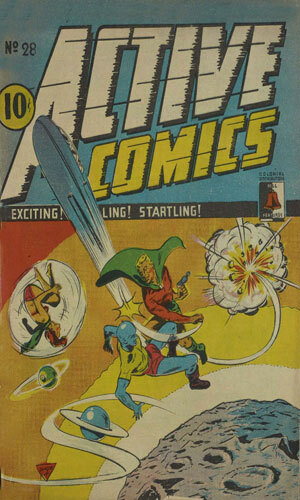 Then he made a one-time appearance in a sister publication, Active Comics and was there for its apparent last hurrah. 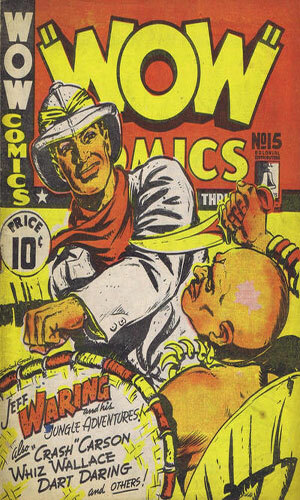 Finally, he switched to Slam-Bang Comics for his last case. From Wow Comics No. 14 with 4 black & white pages. 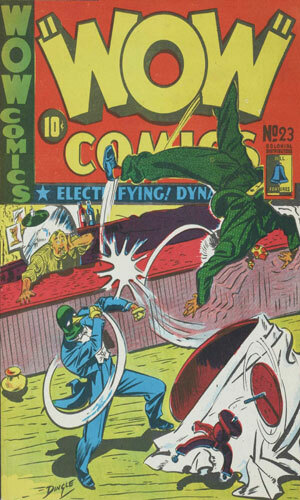 Guy Powers enlists his services during WWII to battle against hidden enemies. His first assignment is to investigate the accidents of planes being destroyed. From Wow Comics No. 15 with 4 black & white pages. Diamonds have been taken and Guy Powers needs to know who did it. So, Powers goes to see Van Hoon (Dutch Refugee & Diamond Cutter). But Van Hoon is kidnapped while Powers is talking with him about the stolen diamonds. He must rescue him and find the thief as well. From Wow Comics No. 16 with 4 black & white pages. A refugee has been killed by a Nazi secret agent and it is up to Powers to figures things out. Can he catch the Nazi Spy? From Wow Comics No. 17 with 4 black & white pages. Several planes flying to England have all fallen from the sky at the same place. Guy Powers suspects sabotage at one of the plants and heads there to find the proof. From Wow Comics No. 19 with 4 black & white pages. In a department store Guy Powers tries to buy a model plane with stuck propellers but the clerk says it is just a demo model. 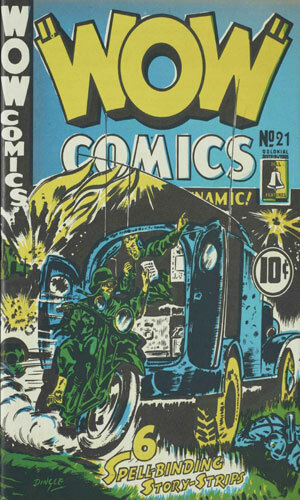 This makes Powers very interested and on the trail of Nazi spies. From Wow Comics No. 20 with 4 black & white pages. A draftsman working on vital military plans is kidnapped while walking with his fiancée. 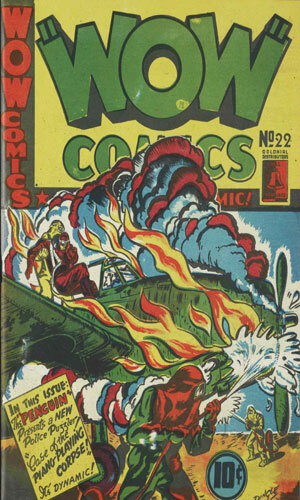 Guy Powers is called into action and discovers a Nazi plot. From Wow Comics No. 21 with 4 black & white pages. Someone is stealing victory bonds and the insurance company covering them is going broke. Guy Powers is asked to investigate. From Wow Comics No. 23 with 4 black & white pages. An ex-actress shows up at Guy Powers' office worried her husband is planning on killing her. In true male compassion, he tells her it's all in her head and sends her on her way. Later she calls to report her husband dead and Powers investigates. From Wow Comics No. 24 and No. 25 with 4 black & white pages each. Around the country several people had died of poison at the hands of the local doctor, causing many to fear their own physician. Guy Powers notices something the police have missed, a strange dye on each victim's hand. From Wow Comics No. 26 and 27 with 10 black & white pages (4 and 6). A woman named Pat Reid that knows Guy Powers visits him at his office and asks for help. She received a letter from a doctor telling how her uncle is not acting right. When Powers and Reid arrive, they are soon involved in a mystery involving a mummy. From Wow Comics No. 28 and 30 with 6 black & white pages each. The head of a powerful diamond empire hires Guy Powers to travel to Africa to find out why the shipments of diamonds has been smaller than normal. Powers lands, literally and figuratively, in the middle of a coup in the country with the largest mine. From Wow Comics No. 29 with 6 black & white pages. Working as a private investigator means taking strange cases and after spotting a car accident in which a man died, Guy Powers is hired by the insurance company to see if everything was on the up-and-up. It wasn't. From Active Comics No. 28 with 7 black & white pages. Thugs are running a protection racket in a North American city with a flamethrower and it is up to Guy Powers to stop them. From Slam-Bang Comics No. 7 with 6 black & white pages. A man named Granger rods criminals to fund his experiments on others. Guy Powers decides to stop him. I give Mr. Powers a fairly low mark largely because the adventures we find of his in the early running are of low appeal and highly illogical. Of course, given only 4 pages in which to set a scenario and then show the resolution, to expect more is not reasonable, however, I have to wonder at the logic of the publisher to decide to have, say, 8 different storylines with 4-6 pages each rather than 4-6 storylines with 8 pages each. At the very end of his run, Guy Powers saw the size of his stories increase a tiny bit, using two issues to tell a full adventure and the tales were a lot more interesting. Alas, too little too late.